The following questions and answers about dividing retirement assets can help you understand how such plans are divided. Ultimately, there are a variety of factors that will influence retirement account division, including when it was accrued, your state's theory of property division, the other marital assets, and how your settlement is framed. Below you'll learn what needs to be taken into consideration, understand what QDRO (Qualified Domestic Relations Order) papers, and more. Is he allowed to use my retirement information in court? Am I entitled to any of his pension? Is my husband entitled to half of my 401K? Can he get half of my retirement if we've only been married 3 years? How will my pension plan be divided? Can we agree to each keep our own retirement funds? Is the 401K value determined at the filing date or the trial date? How are the funds split if he rolled his 401K over into an IRA? Are the pension laws different in each state? Should we split the retirement now or wait till the value rises? Who handles the division of a retirement plan? What happens after the court awards me part of his retirement? How do I get QDRO papers? Why is my lawyer charging me for filing the QDRO papers? How do I get the judge to sign the QDRO after the divorce is final? What if he's refusing to sign the QDRO after the divorce is final? How do I get a court release to access his retirement information? He never gave me the release to speak to the plan administrator. How do I collect my part of his pension? Do I wait until he retires to receive part of his pension? What can I do if the pension payout is less than the divorce stated? Do I have to wait until he retires to get my part of his 401K? How will it affect the pension division if he eventually remarries? Would he get 1/2 my pension if it was withdrawn prior to filing? Will giving retirement funds to my child prevent my husband from getting them? Can I prevent him from taking cash out of his pension? What happens if he cashed out his retirement to spite me? Can I get any of his retirement if the divorce has been finalized? 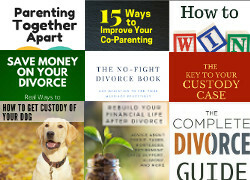 Will I need a lawyer to reopen the divorce to get a QDRO order? Can he reopen the divorce to remove the retirement clause? Can I fight the division of my retirement account after the divorce is over? Abigail's Question: My ex obtained a printout of my military retirement record illegally. This has my date of birth, social security number, and my earnings. He used it in court as evidence for more money. Shouldn't my lawyer have done something about this? Brette's Reply: You would need to provide that information to the court anyhow. Will I have any rights to his retirement? Elaine's Question: I've been married almost 33 years. We are retired and live on his pension as I am too young for Social Security. If we divorce, will I have any rights to part of his pension? Without that, I'd have no income for a minimum of 6 years. Brette's Answer: When you divorce, you are entitled to be supported by your spouse, which includes taking a percentage of his pension. You are also entitled to a portion of the assets of the marriage, as well as part of your spouse's future Social Security income. It would be wise to consult with a family law attorney to discuss the details of your situation. Nikki's Question: I live in an equitable distribution state. My husband worked little over the years by choice, had a provable open affair and has been in trouble with the law for substance abuse problems (he is currently on probation). Is my husband entitled to 50% of my 401(k) when divorcing? Brette's Answer: Equitable distribution means assets and debts will be distributed in a way that is fair, not necessarily 50/50. Whether your spouse is entitled to part of your 401k or to any assets will be dependent on the big picture. The fact that he had an affair is probably not relevant, unless your state allows that to be considered in property distribution. Each party's financial situation is relevant. Talk to your attorney. Maribel's Question: After three years of marriage, I'm filing for divorce. I have a 401K and a retirement plan which I had way before I ever met him. He thinks he will get half of my 401K and retirement money, when HE has not given to either of these accounts. HOW can I stop him from getting some of my money? Brette's Answer: He won't get half. All of your marital assets will be considered (and only the portion of those accounts that accrued during marriage are marital assets). You've only been married three years, so it's unlikely he'll get much. Karen's Question: As a teacher, I have a state pension retirement account presently valued at $40,000+. Does my husband (ex) get 1/2 of the cash value or present value of my pension fund? Brette's Answer: You'll need to speak to a lawyer who practices in your state. There are a variety of factors that will influence the division of a pension, including when you accrued it, your state's theory of property division, your other marital assets, and how your settlement is framed. Kelly's Question: We have been married 25 years. I am a teacher and have a sizable pension. He is a laborer and has a small retirement account. We want to do mediation and settle things for ourselves. Can we agree to each take our own retirement funds even if mine is much more? If he agrees to relinquish his half in mine and keep his, will that work?. Brette's Answer: If you both agree after being completely informed about the amounts, you should be able to do so if the court approves it. Discuss this with your mediator as an option. Gina's Question: We are working cooperatively toward divorce however we have stalled in one particular area related to my 401k. My question is this, do we look at the value of the 401k at the time I filed for divorce or do we look at the value at the time of the trial? Brette's Answer: Generally assets are valued on the separation date, but you want to date all assets to the same date. Mary's Question: My spouse had a substantial amount in the 401 k account when we married and the 401K account has accrued a lot more during our marriage....I know that in a divorce I am allowed half of what was accrued during the marriage. But what if he retired and rolls the money into an IRA. Am I still entitled to half of the money accrued during the marriage? Also if he starts withdrawing on the retirement account, does that entitled me to less if we get divorced? Brette's Answer: It doesn't matter where the funds are - if they are marital assets, they are subject to division. Generally assets are valued as of the date of separation, so withdrawals after that date would not impact your share. Talk to an attorney in your state for detailed information and personal advice. Diane's Question: According to my divorce, I am supposed to receive half of my husband's profit sharing plan. In his deposition he said the fund was "frozen" 2 years before we got married. According to my attorney I am entitled to 1/2 of any deposits after the marriage, not 1/2 of interest/natural growth. The divorce happened in NY. I now live in Colorado. I asked a couple of local attorneys and they said that I am entitled 1/2 of any growth, interest included. Are the laws different in each state? Brette's Answer: No, your divorce decree is interpreted under NY law. It sounds like your first attorney either explained this incorrectly or misunderstood it. Anything your spouse earns after the divorce is not subject to property division. If your first attorney is sure that is what you are entitled to, ask him to enforce it. JoAnne's Question: I'm currently in negotiations of a divorce. We both want an uncontested divorce; however, when it comes to me getting my soon to be ex-husband's 401k, he wants to wait until the market value rises and then split the money 2-5 years from now instead of giving me the money now. What do you think of that? Brette's Answer: I think that half today equals half in 5 years plus interest. He's getting the same amount either way. It's easier to do it all now than have to try to resolve unfinished things in 5 years when you've both moved on. You should consult with an attorney about what would be the best thing for you to do. Good luck. Joanie's Question: I am supposed to be getting a certain amount of my husband's 401K and retirement fund. When I ask my lawyer, she says she doesn't handle this, my husband does. Is this true? Brette's Answer: The plan administrator has to do it and your husband has to get the paperwork going. However, your attorney should follow up with his about it. Emmy's Question: My ex was court ordered to pay me half of his 401K. How long is this process? It will be 8 months and not a word from anyone. Brette's Answer: You've got to submit a QDRO (qualified domestics relations order) which then gets submitted to the 401k administrator. Cinthya's Question: The Judge granted me with half of my husband's 401k. I have contacted the 401k representative and the lady asked me for the QDRO copies. I have gone through my papers and can't find it. Where I need to get those papers? Brette's Answer: A QDRO is a document that must be prepared by an attorney because it is very complicated. Some companies may be willing to assist you in preparing it, but in general they don't feel it is their responsibility. Kristen's Question: My ex-husband has been awarded half of my 401k. Our QDRO has been prepared and is ready to be submitted to the court for the judge's signature. My lawyer wants to charge me $300 JUST to file the paperwork with the court. Is this something I can do myself? Brette's Answer: I find it hard to believe the $300 is simply to mail the form in - are you sure that does not include some of the preparation? You will need to pay the attorney for completing the form. You could offer to come pick it up and take it to the courthouse yourself if that would save some money, but your attorney likely has a motion prepared to go with it or correspondence to the court explaining what it is and what needs to be done. What if he won't sign the QDRO after the divorce is finalized? Ceceila's Question: My divorce was final 2 months ago and during mediation we both agreed that I would receive half of his 401k. He has since decided he does not agree with this and has refused to sign the QDRO. Can he get away with not signing? Brette's Answer: If your settlement is signed and accepted by the court and incorporated into your order, then no he can't. You have to go back to court to file papers for a violation/enforcement of the order. Kimberly's Question: Did my own Pro Se divorce, finalized last month, forgot to bring QDRO and have judge and clerk sign and date the day of divorce. The company will not accept the QDRO without this. How can I easily fix this small glitch? Brette's Reply: Call the court clerk and find out what procedure they need you to follow. 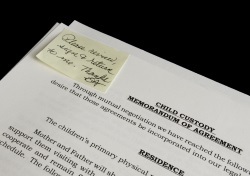 If the order specifies division of this, you may be able to just submit for signature. Cecilia's Question: In my divorce settlement, I am entitled to 1/2 of a pension provided by vesting in the place my husband works for. How do I collect it? Debbie's Question: I was awarded half of my ex-husband’s pension and he has recently turned 62. I have a qdro on file. Do I have to wait until he decides to retire before I can collect my half? Brette's Answer: This needed to be determined as part of the divorce judgment. You should talk to your attorney about how to enforce your QDRO and when your funds will be disbursed. What if the pension payout is less than the divorce stated? Awilda's Question: My original lawyer retired and his son took over the firm. He continued to finalize my QDRO's by drafting them and finally getting approval from the company. My ex retired last May and now that the amount that I had been receiving of $540 has been reduced to $308. I have contacted the attorney who drafted the QDRO's, and he insists on having to charge me again because his father never paid him to finalize the documents. What can be done other than have this attorney investigated. My ex signed a paper stating that he would pay me $540 per month and the attorney has that paper. What recourse do I have? Brette's Answer: You need to pull out all documentation you have from this law office - retainer agreement and invoices. This should indicate if you paid for this work or not. If you have paid for it, you need to contact your state bar attorney grievance program and file a grievance. They will investigate. You also need to understand exactly what the QDRO paperwork says. With the fall of the stock market, there is likely less in that account. Gina's Question: If I want part of my ex-husbands 401 K, do I have to wait until he retires to get it? Brette's Answer: No, if you are awarded part of your spouse's 401K, your part is removed upon issuance of the judgment or order. However, in order to get this money, you need an attorney to prepare a QDRO - qualified domestic relations order, which must be written to meet the specific 401k plan requirements. When you get the money, you roll it over into an IRA for your own retirement purposes. How will it affect pension division if he eventually remarries? 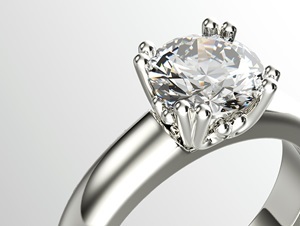 Julia's Question: My husband wants a divorce and he has 2 private pensions which are payable when he retires. Would I be entitled to any of his pension when he retires? If he remarries, what would the situation be? We have been married for 23yrs. Hope you can help me with this confusion. Brette's Answer: Yes, you would likely be entitled to a portion of the pensions. You need to hire an attorney for this. If he remarries, it would not change what you are awarded in the divorce. How can I get a court release to access his retirement information? Rose Asks: We're in the process of divorcing and are still trying to settle. I just found out my soon-to-be ex cashed in half of his 401K/rollover IRA in April of this year. What can be done to stop anymore $ from disappearing? I called the fund company and they won't give me copies of statements unless the court orders them to. I get legal advice through the self-help department of the courts. Brette's Answer: Ask the self-help department to help you prepare a subpoena the court will sign which will allow you to get the documents. You'll need to show the court what he withdrew and when and he'll be held accountable for it. He never gave me a release to speak to the plan administrator. Catherine's Question: I was divorced 12 years ago. The decree states that I am entitled to a portion of his retirement based upon the time we were married. He was supposed to give me a release to speak with a plan administrator, but has not to date. He is taking funds out of the account now, and I am wondering what my options are. Brette's Answer: Get an attorney and go back to court because he has violated the order. Can I liquidate my part of his pension to buy out his home equity? Teresa's Question: Can I be awarded husband's 401k and use it as liquid assets immediately? I will need the money to pay him equity in the house. Brette Answers: If you liquidate it you'll pay a penalty and taxes. Why aren't you asking to set off the fund against the equity instead? Can he buy back the portion of his pension that was awarded to me? Question: My ex wants to buy back the pension that was awarded to me. How can we do this? Brette's Answer: You need to be careful about this and consult an attorney. The best plan is probably to modify the decree to reflect this. Stephanie's Question: Say I quit my good job in July for a less-stressful, lower-paying job which starts a month later and didn't tell my spouse. Upon quitting, I opted to have all my pension funds withdrawn into my private checking account, instead of rolling them over into another IRA-type fund. Now my spouse serves me with divorce papers in September. During August I may have lost all the money at the casino or stuffed it in my mattress. Would my spouse have any grounds for getting half my retirement? Brette's Answer: Your pension is a marital asset and you could be responsible for dissipating that asset. If you withdraw in July and divorce is begun in Sept you have an argument, but the problem is your spouse didn't know about or agree to what you did. And if you knew a divorce was coming, it doesn't look good. You need to see an attorney about this. Kim's Question: We're in the process of uncontested divorce, but now he has stated that he wants 1/2 of my 401k. Can I take money from my 401k and give it to my daughter as a gift to avoid my husband getting the funds? Brette's Answer: First of all, if you disagree about your 401k, your divorce is not uncontested; unless you have filed papers and he has either not responded or has filed paperwork stating he is not contesting it. If that is the case, he has no say over the division of the assets since he has waived his right to participate. If you are in a situation where that has not happened and you agree about everything but this one situation, that's different. No, you cannot take money out and give it to your daughter. The money is a marital asset which must be distributed in your divorce. Good luck. Can I stop him from taking cash out of his pension? Faye's Question: We're separating and I have found out that he is taking cash out on his pension plan. The spouse has to give consent. Am I entitled to half of the pension money? Brette's Answer: To stop this, you need to open a divorce or separation proceeding and ask for an order estopping him from dissipating marital assets. You have an interest in his pension since it is a marital asset. How it will be divided will be decided by the court as part of your overall financial order. What if he cashed out his retirement after I filed for divorce? Debbie: My soon to be ex has dissipated marital assets by selling shares from his 401 K after I filed divorce papers. He basically sold almost everything that was in it. I informed my attorney about it, as she knows what was in the account when I filed divorce papers and knows what is in it now. Can he be held responsible and will I still get my fair share since we know he did it and have all the dates of when he did it? Brette's Answer: Yes, it's marital property. Your lawyer will be able to obtain the records showing what was withdrawn when and it will be accounted for in the divorce. You won't lose out because of it. Can I sue for retirement division after the divorce is finalized? Judy's Question: Is it possible to sue for any retirement accounts after a divorce has been finalized 5 years ago? Brette's Answer: It is possible, but to change the terms of the financial settlement you either need to show that there wasn't proper disclosure at the time of the judgment, or that there's been a change in circumstances. You should pull out your divorce decree or settlement and read it and possibly consult an attorney who can interpret it. This should have been handled at the time of the divorce, and most likely was. If not, it is something that could be revisited. You should talk to a family law attorney who can discuss the particulars of your situation in light of your state's specific laws and requirements. 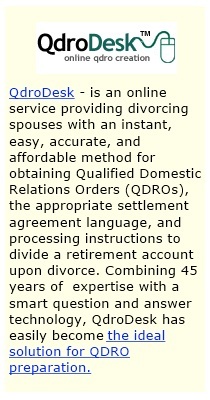 Do I need an attorney to reopen the divorce to get a QDRO order? Sher's Question: I was married 19 years to an Air Force officer. My ex told me because Delaware (where the divorce was filed) was not a community property state, he did not have to pay me any of his future retirement. Now I have learned about the USPA and want to seek to re-open the divorce and ask for a QDRO order. I got the form from the DE court to ask to re-open the case. Do I need to have an attorney to take this to court and get the QDRO approved or is alright/acceptable to do this myself? Brette's Answer: You need an attorney to handle a QDRO. Can a divorce be appealed to remove the retirement clause? Martha's Question: My husband and his ex were divorced about 9 years ago, and she received 1/2 of his retirement in the uncontested divorce. Can he reopen the file after this amount of time? His retirement is coming up and we feel he has been ripped off. Brette's Answer: You don't get to go back and have a case redone just because you think it didn't turn out the way you wanted. He could have appealed at the time, but the opportunity for that is long past. Janes's Question: The judge in our proceedings awarded my ex 50% of my teacher retirement. My ex had no retirement or pension. Would it be feasible to go back to court and fight this? My attorney appealed with no luck. Brette's Answer: No. The decree is final and so is the appeal. Go see another attorney if you want another opinion.